Americans spend more home improvement dollars on their bathrooms than on any other single remodeling project. The bathroom is no longer just a functional necessity. It has become a primary focus for luxury and relaxation, and a bathroom remodel is no longer just an upgrade from what was there before, but just about every available comfort and convenience has been incorporated in bath fixtures and amenities to render the bathroom far more than only a place of utility. If an ADA bathroom remodel or, the next best thing, a more accessible bath is what you need, there is no need to compromise form for function. Next Level Remodeling can transform your bath into what you always dreamed it could be—or beyond. Good bathroom remodel should be well designed, well built, on time, and on budget. This requires skillful coordination and management, and you can count on us to carry out your bathroom project with flawless execution. As one of the best bathroom remodeling contractors in South Jersey, Next Level Remodeling’s years of expertise assures the kind of bathroom remodel and quality home renovation you insist upon for your family and your home. You can visualize your dream bathroom with our professional 3D rendering software. You have a unified team working for you. We are the design-build bathroom leaders, being your single contact from first draft design, through final construction cleanup. You can have peace of mind, as we are licensed and insured, and have an excellent reputation with South Jersey homeowners. You will enjoy your bathroom remodeling experience. We pride ourselves in taking care of all the details, and our meticulous attention to detail ensures you won’t have to worry about the quality of products used or workmanship performed. 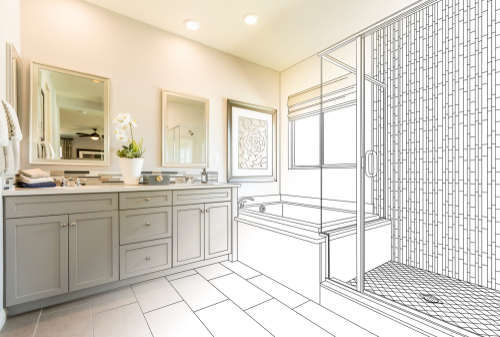 Choose Next Level Remodeling when you are thinking about your bathroom remodeling project! Our bathroom renovation experts can answer all your project questions, and can give you a no-obligation estimate. Call us now today to schedule you’re free in home consultation. View our Bathroom Photo Gallery for new ideas and some great before and after photos of our bathroom renovations. View our the Bathroom Remodeling jobs recently completed by Next Level Remodeling in the South Jersey area.